Bottom of the barrel. That’s a common expression used to describe something not of very good quality. Sadly, it is an idiom that accurately depicts the condition of two NHL teams: the Edmonton Oilers and the Carolina Hurricanes. A glance at the current standings shows two teams firmly at the bottom. The Oilers are 7-19-5 with 19 points. They are on a four-game losing streak. The ‘Canes are 8-13-3 with 19 points, and on a five-game losing streak. Even the Buffalo Sabres – recently the subject of potential Connor McDavid suitors – have righted their ship and are on a four-game winning streak. Since that historic day in June of 2006, the two teams have gone in similar directions. Edmonton has not been back to the playoffs. Carolina has once. In the 2008-09 season, they made it to the Eastern Conference Finals, where they lost in four games to the eventual Stanley Cup champion Pittsburgh Penguins. It can be said that Oilers fans have had a bit tougher run since 2006, but not that much tougher. The ‘Canes have had some seasons since 2008-09 that have tested even the most ardent fans’ loyalty. Hurricanes have had somewhat more stability behind the bench. Since coming to North Carolina from Hartford, they had either Paul Maurice or Peter Laviolette as head coach until the 2011-12 season. Kirk Muller took over during that season and led the team through last season. Bill Peters was brought in by the new GM Ron Francis. 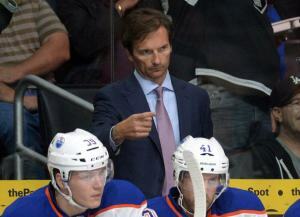 He is a rookie NHL head coach. If you add them up, they have had 4 coaches since the 2006 Cup win. The Oilers are now on their 6th head coach since 2006. Newly appointed Craig MacTavish was their coach through 2009. Bill Peters is a NHL rookie head coach. 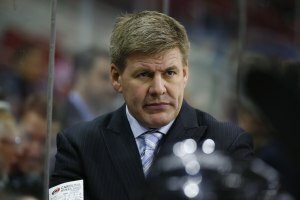 Bill Peters has a team that is laden with youth. Jeff Skinner at 22 is young, albeit in his fourth season. Elias Lindholm is 20. Andrej Nestrasil is 23. Victor Rask is 21. Justin Faulk is 22. Newly called-up Justin Shugg is 22. Four players are 25. That is a young team for the rookie coach. I was intrigued recently by an observation made by Hurricanes TV play-by-play man, John Forslund. He told Mike Maniscalco on the ‘Canes’ “Aftermath” radio program that the Detroit Red Wings keep their young guys in the system until they are ready to play at the NHL level. They rarely draft and instead grow their team from within. No one can argue that it has not worked for the Red Wings. The challenge for a coach – rookie or otherwise – of trying to grow young, inexperienced players into NHL-ready performers is daunting. It was something that Dallas Eakins faced, and something that Bill Peters faces in Carolina. While some may see this as a possible precursor of bad times for Coach Peters, I do not. There are other factors besides age in what makes a winning or losing hockey team. In fact, the title of the piece includes MacTavish saying “there’s blood all over my hands.” He may have felt that firing Dallas Eakins was the only course of action he had available, but at least publicly he is not throwing him totally under the bus. He is accepting some responsibility, too. Coach Bill Peters is old-school hockey. He inherited a culture in Carolina that recently often produced effortless, losing hockey. In his short tenure he has changed that culture to a great degree. (Not including last Saturday’s outing against the Philadelphia Flyers). Looking at Coach Peters’ eyes during the post-game media gathering, one sees a fire and an intensity that appears very genuine. This is a guy who is not satisfied with losing. I believe that he is slowly turning the team into one that has a strong work ethic and a desire to win. Will he succeed? That depends on forces largely out of his control. Namely, will Carolina Hurricanes owner Peter Karmanos be willing to pay for talent to come to Raleigh and help the ‘Canes compete? Who knows what is going on behind closed doors? Is Karmanos hoping the team does poorly so he can sell assets and hopefully dump big contracts? Does he think that doing so will make his desire to sell a large part of the Hurricanes’ ownership a bit more attractive? (A fan hit me Saturday with that possibility last Saturday). Like I said, “Who knows?” But, I believe sincerely that scraping bottom is unacceptable to Bill Peters, and that he will fight hard for the help and support he needs to build a winner in Carolina.